Imagination Stations, with Dry-Erase Work-Surfaces. 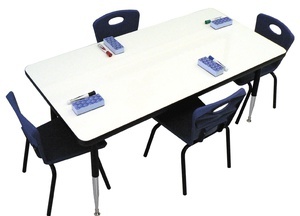 The Allied M5 Series Common Core Aligned MarkerBoard™ Tables promote creativity, mental and physical engagement, and peer cooperation and editing skills. Our 1-1/8" thick particleboard tops, covered in the finest high-pressure dry-erase white laminate, are built to last. The whiteboard laminate is stain resistant, and each table has a heavy-duty vinyl T-molded edge for safety and durability. Allied Plastics Co., Inc., headquartered in Jacksonville, Florida, manufactures tables, table tops and table legs for the school, office and food service, industries. Since 1945, Allied has served these industries by providing a wide range of top-of-the line, custom-crafted tables backed by superior customer service. Today, they sell products through a diverse, non-exclusive network of distributors throughout the United States and internationally.